Serving Our Community By Saving Lives and Protecting Property. 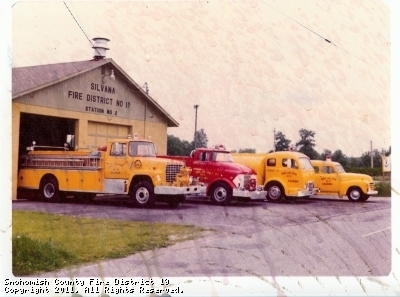 Before 1960, the area around Silvana had two small local volunteer fire departments. The Hill Department organized by Alfred Hovig and the Valley Department organized by Clarence Monson. 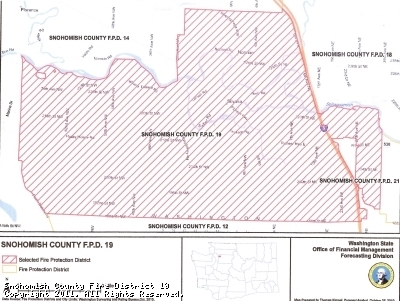 1959 a vote held by the public, authorized the formation of a tax based fire protection district, and Snohomish County Fire district 19 was born. The first district fire station was in downtown Silvana at 1430 pioneer Hwy. The first brand new fire engine was purchased in 1963. Later, in 1972 the need for a second fire station was realized and constructed on 27th AVE in Island Crossing. During the mid-eighties a station was needed on the hill to service the Happy Valley area and the original Hill Fire Department station was reopened with one fire engine. In 1997, land was purchased on Happy Valley Road to build a replacement station for the aging downtown station located in flood plane. During 1998, tax payers voted to fund a tax bond to construct the new station. Phase one construction was completed in July 2003. After several years of rapid growth, Fire District 19 hired its first full time employee Keith Strotz in February 2004. In March of the same year volunteers began staffing the Happy Valley station Monday through Friday during daytime hours on a part paid bases. June of 2006, daytime staffing was expanded again to include weekend coverage. Once again in November 2008 nighttime staffing was enacted to complete the coverage to twenty-four hours a day. May of 2010, construction began on phase two of the headquarters station. Phase two construction is set to be completed in March of 2011 with expanded facilities, sleep rooms, and updated technology for the next twenty years of service. Fire District 19 protects 22 square miles between the cities of Marysville, Arlington, and Stanwood. Fire District 19 operates out of two stations, the staffed headquarters station #94, on Happy Valley Road, and the volunteer station #95, Island Crossing station. Governed by three publicly elected commissioners, a staff of 29 volunteer firefighters and one full time fire chief provide twenty four hour a day protection to our community with a minimum of two fire firefighter/EMTs on duty at all times. In 2011, Fire District 19 responded to over six hundred eighty-eight 911 emergency calls including BLS and ALS medical emergencies, residential and commercial structure fires, auto accidents, water rescue, high angle/low angle rope rescue, and hazardous material incidents. District 19 operates two fire engines, two water tenders, three aid cars, one air-compressor unit, a water rescue boat, one staff vehicle, and one command unit. This site has been viewed 101,403 times.